Atmospheric pollution… elsewhere in space?! Astronomers, like astrochemists and astrobiologists, gaze beyond the skies for signs of exoplanets with liquid water, in the hopes of narrowing down the search for life as we know it somewhere out in space. But for some extrasolar systems, as the authors of today’s astrobite show, we may be looking a bit too late. Today’s authors investigate if water from rocky bodies may be polluting the atmospheres of helium white dwarfs. White dwarfs (aka, WDs) have very high surface gravities. That means that the lightest elements, hydrogen and helium, float at a WD’s surface, while heavier elements, like carbon and oxygen, are dragged down below the surface like crocodiles in quicksand. It takes about a million years for the heavier elements, or metals as astronomers call them, to sink below the surface down to lower atmospheric layers of WDs. That’s a snap of your fingers compared to how it takes billions of years for WDs to cool into black dwarfs. 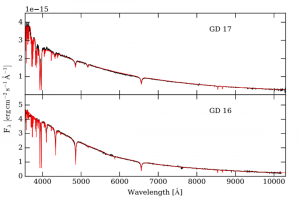 Figure 1: Brand-new spectra for the helium-atmosphere white dwarfs GD 17 (top) and GD 16 (bottom)! The black lines are the actual spectra, while the red lines are model fits to the spectra. Due to the dwarfs’ high surface gravities, you might expect astronomers to see only light elements dominating their atmospheres… but instead, astronomers see trace metals! From Figure 1 in the paper. By looking at the spectra of a WD, astronomers can figure out what sort of elements make up the dwarf’s atmosphere. Today’s authors report that, despite their high surface gravities, around 25% to 50% of all WDs have trace metals contaminating their atmospheres! Not only that, but there are WDs with helium atmospheres (aka, He-WDs) that have trace hydrogen contaminating their atmospheres as well. Caught between a rock and a hot place. Astronomers think they have a pretty good idea of why they see trace metals polluting the atmospheres of WDs: the accretion of rocky bodies. Rocky bodies out in space, like comets, asteroids, and even planets, are made up of metals. If a rocky body happens to orbit or fly by too close to a WD and get caught by the dwarf’s gravity, the dwarf can pull the body in, brutally rip it apart, and then gobble up the pieces. This process is known as accretion. 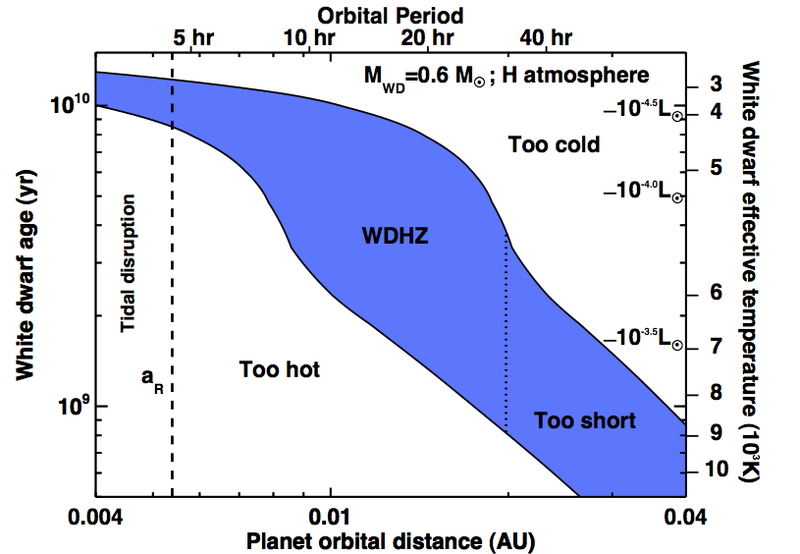 When astronomers see trace metals in a WD’s atmosphere, they understand that to mean that the WD recently (relatively speaking) accreted some rocky body, and the metals from the accretion have yet to settle below the WD’s surface out of sight. But what about this hydrogen contamination that astronomers have detected? Where does it come from? This question is harder to answer. Hydrogen, unlike metals, is by far the most abundant (known) element in space. It’s found in rocky bodies, bound within hydrogen-bearing compounds like water and hydrated minerals, and it’s also found practically everywhere else, such as in dense clouds of molecular gas and in the diffuse interstellar medium. The stubborn pervasiveness of hydrogen throughout space makes it difficult to narrow down how exactly it gets into these WD atmospheres. The authors of today’s astrobite consider one particular origin story: the idea that the trace hydrogen in He-WDs could come, at least in part, from the accretion of rocky bodies that once held water! 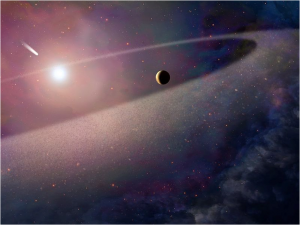 Figure 2: An artist’s spectacular idea of what it would look like to see a comet falling into a white dwarf. Credit to www.spacetelescope.org/images/heic1703a. Previous research groups have searched for proof that the trace hydrogen in He-WDs comes from water by searching their spectra for oxygen specifically. After all, the chemical formula for water is H2O (two hydrogens and an oxygen); so if a hydrogen-contaminated He-WD has an excess of oxygen, that could indicate the He-WD accreted rocky bodies with water. But today’s authors offered another way to look at the problem. Imagine that a WD accreted a water-bearing rocky body some time ago. It’s quite possible that the “oxygen” part of the water, as a metal, may have already sunk below the surface and out of sight – leaving only the “hydrogen” part of the water as something detectable at the surface. Therefore, the authors reasoned that He-WDs may have gotten their trace hydrogen from accreting water-bearing rocky bodies – but the accretion might have happened a while ago, instead of relatively recently, so that we can no longer detect the oxygen. To explore their idea, the authors set up a statistical test, based not on the presence of oxygen alone, but on the presence of metals as a whole. Putting their idea to the test! Today’s authors looked at a sample of 729 He-WD spectra to check for a dependence between metal contamination and hydrogen contamination in He-WDs. They used the Hα line of the Balmer series to determine whether or not a He-WD had any trace hydrogen, and they used the metal calcium, which was an easily observed metal for their spectra sample, as a way to say whether a white dwarf was “metal-polluted” (had metals) or was “metal-free” (had no metals). They found only about 32% of the metal-free He-WDs showed trace hydrogen, while around a whopping 61% of the metal-polluted He-WDs featured trace hydrogen! Just by looking at these two percentages, we can infer a huge difference in the presence of trace hydrogen based on the presence of trace metals. Imagine that, in reality, the presence of metal contamination in He-WDs has nothing to do with whether or not the He-WDs will have hydrogen contamination. Then, how likely are we to end up with this sample, where we measured 32% and 61% of He-WDs had hydrogen contamination for metal-free and metal-polluted He-WDs, respectively? The authors calculated that likeliness – and found that the chance of ending up with these percentages would have been about one in a million! This was certainly enough evidence to reject the idea that there is no dependence between the presence of trace metals and trace hydrogen in He-WDs. The authors decided then that these He-WDs must have picked up at least some of their trace hydrogen by accreting rocky bodies with hydrogen-bearing compounds. And seeing how, for example, the rocky bodies in the Solar System have lots more water than other hydrogen-bearing compounds like methane and ammonia, water is likely the biggest contributor of them all! So when astronomers see trace hydrogen in the atmospheres of He-WDs, they could possibly be seeing the broken pieces of once-habitable, water-bearing rocky bodies that maybe, just maybe, held life as we know it today. And perhaps, as we look at the contaminated spectra of these He-WDs, we’re viewing the future of our own Solar System. Perhaps Earth will one day end up as nothing more than a smear of hydrogen and metals on the surface of the Sun. So stock up on sunscreen, and hold on to those star-shaped plastic sunglasses you wore as a kid – because once that day comes (if it ever does) you’re going to need all the protection from the Sun’s UV rays that you can get!